That's right. The dreaded "b" word. Indeed, sometimes the practice that is necessary to truly cement skills into our minds can be perceived as boring or routine. So...one way I like to keep things fresh is by using task cards. Over the years, I have learned that there are SO many ways to use them, so I thought I'd share a few of my favorites! 1. Brain Boosting Warm ups! I think we often use task cards to supplement independent or station work--but good task cards are GREAT whole class warm ups! If you have a document camera it makes it a snap, but if you don't-try enlarging it (or rewriting it on construction or chart paper) to display. In addition to focusing the class and getting their brains ready to work, this is a great way to model how you want the REST of the cards in the collection to be used in centers or in a more independent way. My students seemed to be struggling with more complex types of patterns, so for a few days I warmed up our math class with different pattern cards where we talked through them, compared solutions, and so on. Students did the work in their math spiral and we were ready to roll! Now I can use the rest of the set for reinforcement. Sometimes we forget that task cards can be used collaboratively as well and can really get discussion going. Again, this might be a great way to scaffold the work on the cards to help students prepare to do more cards later on their own--or you might just value the discussion and collaboration a good task card can provide. These cards are creative writing cards to help improve students' use of dialogue--and I saw SUCH creativity when they worked on them together! Same here...these cards are all about discovering the meaning of different adages--and the discussions students had were stellar--they really worked like detectives to determine the meaning of the different sayings. OK--we all have those students. You know the ones--no matter how rigorous you think your lesson is, they finish it light years ahead of everyone else--and they did it flawlessly. This is a GOOD thing! That being said, teachers are always on the lookout for meaningful work for their fast finishers. 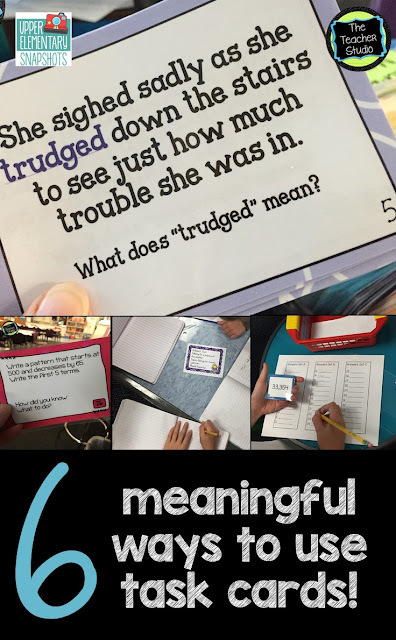 Using task cards that either supplement your curriculum or extend it are great ways for students to do meaningful work when they finish their requirements. I love to work in cool facts and interesting topics that aren't a part of our regular curriculum but that keep students interested. 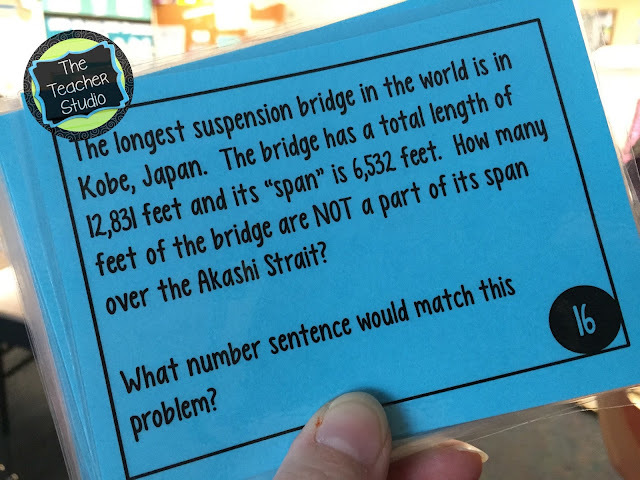 These are word problems of "Amazing Geography Facts" that fascinate my fast finishers! Another dilemma facing teachers is how to meet the needs of different levels of students while running a math workshop or guided math system. One thing that can be extremely helpful is to use task cards at various levels. 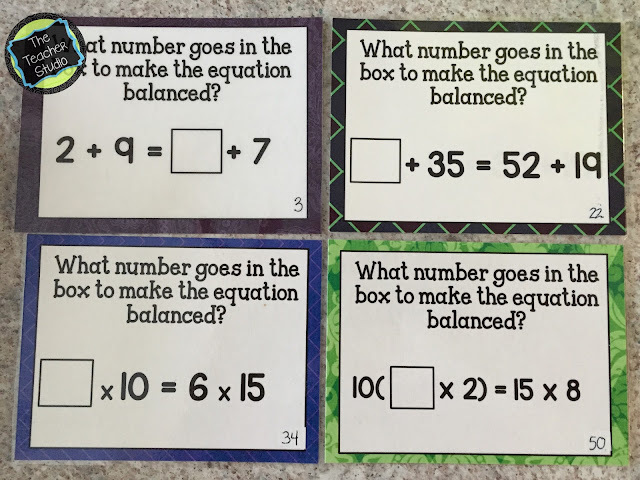 These cards can be differentiated in two ways--by having students use cards at different levels on one topic (for example, some students are working on addition with regrouping on two digit numbers while others are using 3, 4, and 5 digit numbers) OR by having students work on cards that are at a "just right level" but may be on different topics. 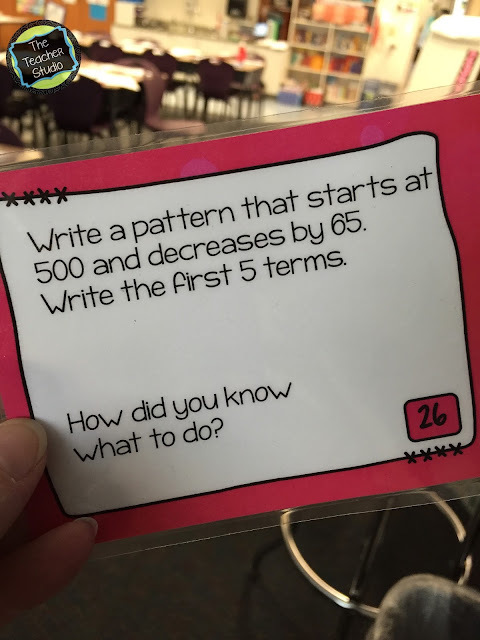 For example, I might have some of my students who are doing well with our current unit use some task cards that are quite rigorous...maybe challenging word problems...while students who need additional practice at a skill (last week, subtraction with regrouping) work with cards to reinforce this needed concept. 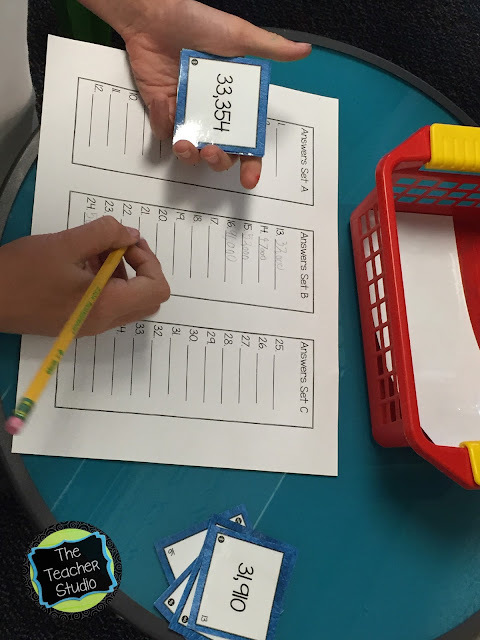 This way, you could have a station where they use task cards--but they are using the cards that are just right for them! A few weeks ago we were working on algebra thinking--some students were using the very first set (I had done the first 6 cards as whole class warm ups as mentioned in #1!) while others started right at set 2 and started working their way through them. No one has gotten to the green set yet--but next week I will pull a small group to talk about order of operations and then they will be all set! We all know that sometimes we need to meet with students in small groups to really tackle some in-depth learning. It's wonderful when we can create a center where other students can work on meaningful tasks that serve as either challenges or review. My students were really struggling with rounding to different places, so even after the unit was complete, I used a set of cards as a station during a day of math workshop where they tested their memory! I had a basket of cards AND the answer key so students could check their work when they finished. One thing that I really believe to be true about math workshop is that a climate for "honesty" be established. We talk at length about why I would ever provide the answers...and students by this point in the year understand that the answers are a way for them to check their own understanding--and to determine if they need more coaching on a given topic. This coaching could come from me or from another student...but they have learned that these centers are a great time for them to test themselves and decide whether or not they feel secure. This is a pretty valuable life skill if you ask me! This might be my favorite. (OK...I honestly can't say that--but I DO know it has been a difference maker for me). So often, students who need intervention in one area, need it in a million areas. Noticed this? I have taken to using task cards when I meet with some of my groups to do quick, down and dirty intervention sessions. In 5 minutes, we may be able to do 2-3 cards, discuss, practice, and so on--and then can meet again the next day to do a few more. My students LOVE it...they feel successful. They feel their time is well spent. They see progress. 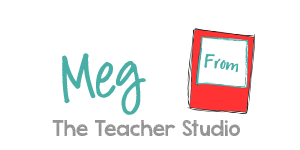 I love it because I have a well organized set of tasks that are all ready to go...I can get a lot of "bang for my buck"...my students can focus for these short sessions...and once they are doing well, I can let them work more independently. 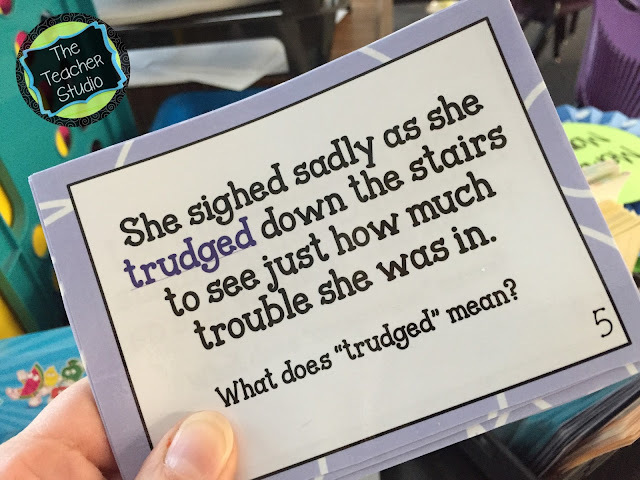 The example below is for a group of students who are really struggling with context clues. 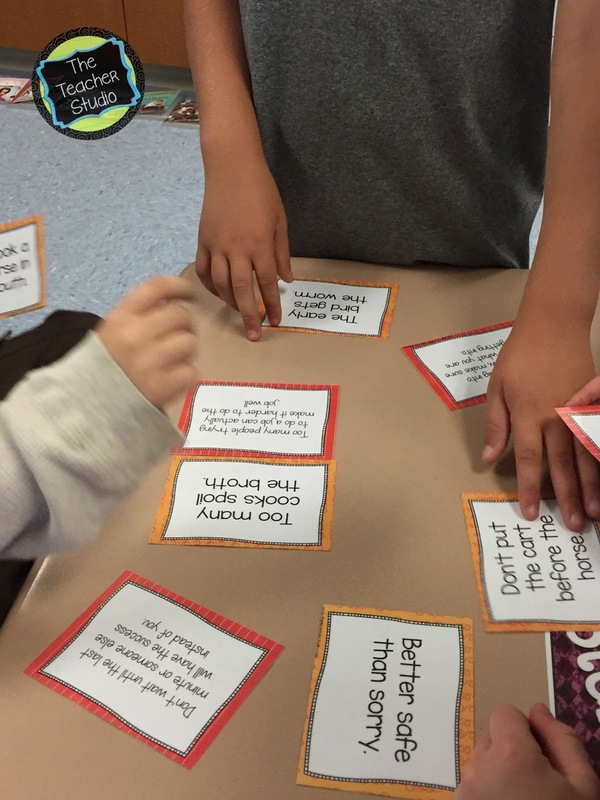 I used a few cards to introduce the concept to the class and then, based on my reading conferences, pulled 7 students who seem to not be able to do this independently. I worked with some individually and some in pairs--the discussion with the pairs was awesome! 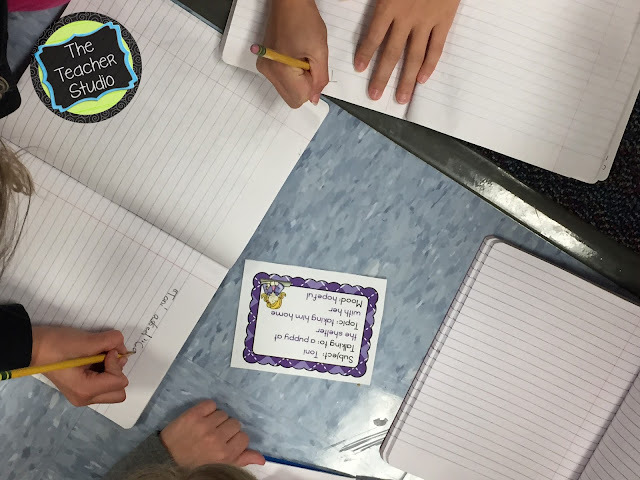 They came up with lots of possible meanings for the "purple words" and we were able to have great discussions about tricks and techniques for tackling unknown words in our reading. Did all my students need these cards? Nope! But this group of 7 did--and I loved having 8 lesson's worth of content at my fingertips! So...whether you gather up task cards from your favorite sellers or make your own, think about what a flexible tool task cards can be! Get creative--you don't need to have fancy fonts and backgrounds to make a task card--even a stack of index cards will do! If you are interested in any of the ones shown above, just click the image and it will take you to the product description. Thanks so much for stopping by--and please have a safe and relaxing Thanksgiving. I know all of us here at Upper Elementary Snapshots are thankful for YOU and your support over the years!